Laura Furiosi, 35, has endometriosis, where the lining of your uterus grows in other parts of your body. Hers has even made it to her diaphragm. When I was a teenager, I collapsed from pain in my abdomen. I thought I had appendicitis. It was endometriosis in my uterus and ovaries – but I’m one of the lucky ones because I got diagnosed straight away. I struggled with it a fair bit over my young teens and twenties. It feels like a deep debilitating pain. It started off around my period but as the endo grows, the pain is there all the time. It can stop me walking and even make me pass out. 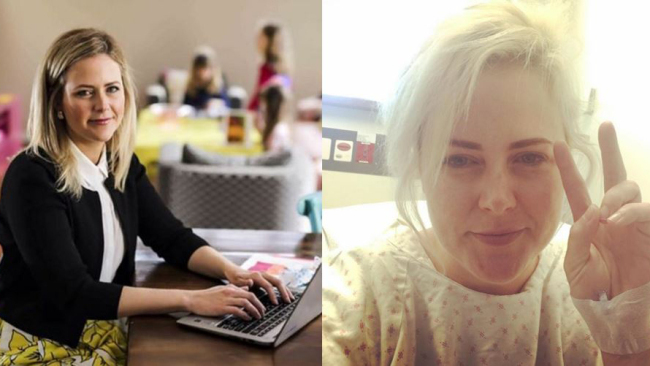 I’m now 35, and have been living for around two decades with endometriosis. It’s not just tummy pains, it turns up as referred pain in my shoulder, back and hips. There’s no cure, and for me my only option is surgery to have it excised. I’m fine for a little while after, but then it grows back. I’m up to 15 surgeries now. After, the doctors are amazed I’m walking around. The one I had when I was 21, they found it in places they didn’t know it could go. It may have been a precursor. I had a massive surgery, recently where they found it on my diaphragm. I’d gone through three years of doctor’s appointments, pleading with them that something was wrong. They checked for irritable bowel, heart problems, asthma, heart burn, lung problems. I even got told, maybe my problem was psychological and I should see a psychiatrist. That stands out as my darkest moment – when someone in the medical profession didn’t believe my pain. It really got to me. But I knew the feelings and persisted. I pushed through and three years on found a really amazing surgeon, who found the endometriosis sitting right underneath my liver. He was the third surgeon to look, and he only found it because he tipped me on my side and the liver flopped over and it was under there. I was so ecstatic he’d found it because it hadn’t come up in scans. I’d only heard of diaphragmatic endometriosis, when I was searching for answers to my pain on an online support group I’m part of – a woman on there had it. I’m unsure of the exact numbers but I know it’s pretty rare. It affects everything. I was doing kickboxing but I had to give it up because it was too painful for my diaphragm. I’m also in a choir, which I adore, but the long notes are nearly impossible. Twice I’ve taken hormonal drugs, so I can give my body a break for six months and get overseas to do trade shows for my company. It’s sort of like early menopause and a last resort. I’ve heard it can help others long-term, but for me it only holds off the inevitable, it doesn’t fix it. I’m lucky I run my own business, because if I didn’t work for myself, I wouldn’t have a job. I own a toddler and baby swimwear label called Rashoodz. We’re distributed in Walmart and made a huge deal in China in July. I want to show women you might have a disability or disease, but you can find a way to get around it and achieve. Endometriosis is not taboo but people might roll their eyes because it’s an invisible disease. People see me going overseas and walking my kids to sport, and I can tell they think, ‘she doesn’t look sick’. What they don’t know is that I’ve taken painkillers and had to sleep at lunch, just to walks my kids home from school. Living with endometriosis is not something I talk about much with people who don’t understand. I need to start talking about it more so we get somewhere with it because one in 10 women have it. It’s not just about periods and infertility, it’s a chronic disease that can ruin your life and you can get it anywhere – your brain, lungs, diaphragm, you name it – and there’s no cure. This is why I’m persisting with pushing for more research and awareness. I’m also a mother of three girls – 10, 8 and 6. I have missed school presentations and birthday parties, because I’ve been in hospital. They’re used to it and my husband has really stepped it up, but the possibility that one of my girls may have to experience endometriosis one day, fill me with dread. If I could go back and talk to myself as a young woman, I’d say, ‘find yourself an endo specialist’. I would have managed to avoid a lot more surgeries. Most importantly, stand up for yourself, you know you, and develop a thick skin. Look after your mental health and prioritise self-care. I’m lucky to be able to share regular mental health days with my friends. I’m asking Australians to support March Into Yellow – a movement to start a conversation about endometriosis. Anybody can wear yellow for the month of March and set up an everyday hero account to raise funds. Let’s find a cure.